Sentenced to twelve years in prison, Nate McClusky is about to be released on a technicality after six when he tangles with and kills a senior member of the Aryan Brotherhood. A death sentence is placed on his head, along with his ex-wife and daughter. Within minutes of leaving prison he has stolen a car and raced to his daughter’s school. Eleven years old, Polly can barely remember her father, but agrees to leave with him. Nate is too late though to save his ex-wife and her new partner. As well as avoiding the Aryan Brotherhood, Nate is now also on the run from the police for kidnap and murder. Unsure who to trust, Nate must teach his daughter how to survive in a deadly world as they seek to not only stay alive but take the fight to his enemies. For Polly, who partly communicates through her ventriloquist teddy bear, it’s a high stakes, violent coming-of-age, but neither McClusky is going down without a fight. 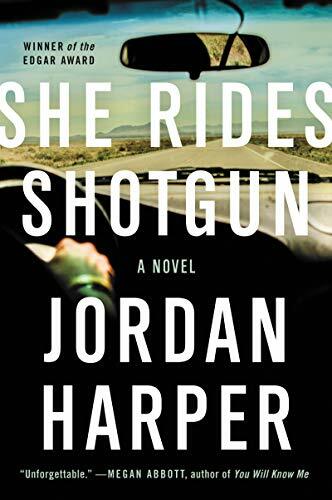 She Rides Shotgun is a noir tale of a father and daughter struggling to take on a major criminal gang, the Aryan Brotherhood, and survive. With his ex-wife dead, Nate collects eleven year old Polly and tries to disappear into Los Angeles’ underbelly. Living by their wits and the occasional armed robbery, and exacting bloody revenge, Nate decides that the only way to make the death sentence placed on the two of them go away is to cause so much destruction and lost income that the Brotherhood call quits. Polly transforms from a relatively innocent, bullied school girl into a mini-Bonnie Parker. Polly and her teddy bear are the undoubted stars of the tale. Polly is a mix of innocence and determined cunning who quickly learns to take care of herself and look out for her father. As their exploits grow more audacious and a cop closes in on them, the stakes are raised to another level. 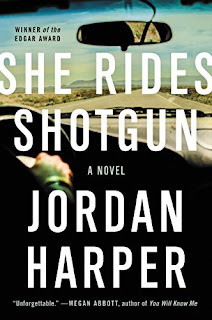 Harper provides a very nice balance of character development and action, telling a fresh, modern-day noir that slowly ratchets up the tension to a dramatic denouement. It’s difficult to see how the story could be improved – an excellent, engaging coming-of-age tale with a twist. 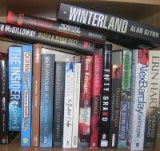 Though not my typical kind of read, this book had gotten on my TBR after positive reviews by several bloggers. Good to see that you that you liked it quite a bit as well, in part because of a good characterization.